Secretary-General of the United Nations António Guterres (r) addresses the World Economic Forum in Davos, Swizerland alongside Forum President, Børge Brende, on 24 January 2019. The world’s problems are “more and more integrated” but the response to them is increasingly “fragmented” and “dysfunctional”, UN Secretary-General António Guterres said on Thursday, in an appeal for governments and other partners to respond to people’s grievances and recommit to international cooperation. In his “State of the World” address, delivered at the World Economic Forum (WEF) in Davos, Switzerland, Mr. Guterres gave a comprehensive assessment of current global risks and challenges, while also noting “a wind of hope” for potential conflict resolution in the Central African Republic, South Sudan, Yemen and Syria. Much greater solidarity is needed to counter the many challenges facing the world, he insisted, highlighting the “paralysis” of the UN Security Council on certain issues, and the fact that relations between the world’s three superpowers – China, Russia and the United States – had “never been as dysfunctional” as they are today. In light of this “multipolar” situation, and the involvement of other States such as Iran, Turkey and Saudi Arabia in the Syrian conflict, Mr. Guterres called for greater involvement in multilateral organizations, suggesting that it was an absence of these mechanisms that had led to the First World War. “If one looks at global politics and geo-political tensions, the global economy and megatrends including climate change, the movement of people and digitalization, the truth is that they are more and more interlinked… but the responses are fragmented,” he said, warning that “if these are not reversed, it’s a recipe for disaster”. Focusing on climate change as one of the key challenges facing the world, the UN chief insisted that “we are losing the race” to manage it. “Climate change is running faster than we are,” he said, highlighting that even though the reality was “proving to be worse than what science has foreseen” as the world experiences ever-warmer temperatures, political will to do something about it was “slowing down”. And in a context of continuing national subsidies for fossil fuel-burning industries, only limited carbon pricing and persistent climate change doubters, Mr. Guterres regretted the fact that this should be so, at a time when the “technology is on our side and when we see more and more the business community ready to respond in a positive way and the civil society more and more engaged”. These were being encouraged by trade disputes – which were “essentially a political problem”, he maintained – along with higher levels of debt than before the 2008-9 financial crisis. 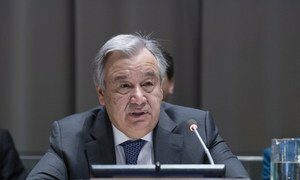 Both issues prevented countries from responding to emerging crises and implementing major infrastructure projects that were necessary for sustainable development, Mr. Guterres explained, noting also a growing lack of trust with governments “and international organizations like ours”. On globalization and technological progress, which had brought “fantastic improvements” to many, Mr. Guterres noted that these developments had increased inequality and marginalized millions, both within countries, and between them. With disillusionment the result, and amid the mass movement of people in search of a better life or shelter, the UN Secretary-General insisted that although he firmly believed a coordinated and global response was the answer, more needed to be done to convince those who felt differently. Achieving this cannot be done by governments or international organizations alone, Mr. Guterres said, before calling for more space for other actors to get involved in a revived 21st century multilateral model. Among his other priorities, the UN Secretary-General underlined his wish to show the “added value” of the United Nations. He pointed to the recent meeting on climate change in Katowice, Poland, where Member States agreed on the basis to move forward on the 2015 Paris Agreement on climate change, at which parties undertook to limit global temperature increase to 1.5C. On Yemen, he insisted that the UN was pushing for a “surge in diplomacy for peace” after a first ceasefire accord was signed in Sweden at the end of last year, while “many other situations have been improving in recent times” he said, including South Sudan and Ethiopia. 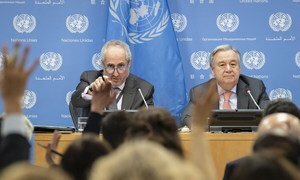 “We are there, we are doing things that are necessary, and nobody can replace the United Nations in this way,” Mr. Guterres said, adding that the UN was still responsible for distributing more than half the aid in the world today. Despite countless “headwinds” and “ills”, the United Nations has “made a real difference” in 2018 and will need to achieve even more in 2019, as the planet faces “a world of trouble”.